The exercise took place across two phases in the Bay of Bengal. On Sunday, the navies of India and Russia concluded a major bilateral naval exercise, Indra Navy 2018, in the Bay of Bengal. Ten warships from both sides, including one Indian Navy submarine, participated in the exercise, according to the Indian Ministry of Defense. This year’s exercise was the 10th iteration of the Indra Navy series between the two countries. 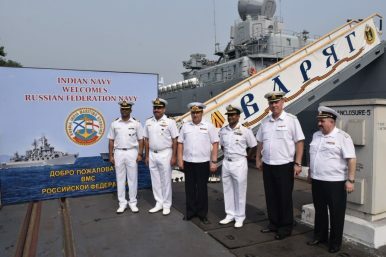 The exercise follows a visit to Russia by Admiral Sunil Lanba, the chief of naval staff for the Indian Navy. Lanba visited Russia from November 26 to 29 to discuss bilateral military cooperation and exercises, including the Indra Navy series. This year’s exercise included multiple components, including visit, board, search, and seize drills, underway replenishment at sea drills, and anti-submarine warfare drills. The two navies also conducted live-firings against aerial targets. “During the exercise, sailors of Russia’s Pacific Fleet and Indian Navy’s Eastern Fleet improved their practical skills of joint tactical maneuvers, refueling of ships from a tanker while in motion, an inspection of a suspicious vessel,” the press office of the Russian Navy’s Pacific Fleet noted. “The primary aim of the exercise is to increase inter-operability amongst the two navies, develop common understanding and procedures for maritime security operations,” the Indian Ministry of Defense noted in a separate statement. The Russian Navy’s Pacific Fleet flagship Varyag participated in this year’s iteration of Indra Navy. It was accompanied by the Admiral Panteleyev, an anti-submarine warfare ship, and a sea tanker, Boris Butoma. The Indian Navy, meanwhile, included “INS Ranvir, a guided missile destroyer, INS Satpura, an indigenous frigate, INS Kadmatt, an indigenous anti- submarine warfare (ASW) corvette, IN Ships Kuthar and Khanjar both indigenous missile corvettes and INS Jyoti, a fleet tanker,” according to an Indian Ministry of Defense release. India and Russia have a major defense relationship dating back to the Cold War. New Delhi is a major importer of Russian arms and the two sides conduct regular exercises. The last iteration of Indra Navy took place in December 2016, also in the Bay of Bengal. India and Russia have reportedly signed a $3 billion lease agreement for a nuclear-powered attack sub today.